Get ready world. the Rock N Roll Pickleball initiative to make the sport of pickleball available and accessible for everyone has officially launched. Well-known para-pickleball player and ambassador Adrienne Barlow has Rock N Roll Pickleball off to a great start. It is a great cause that every pickleball player can rally behind because it champions the idea that everyone, and I mean everyone, can play our great sport and should have access to courts to play. Adrienne has dedicated her life to advocating inclusion and accessibility for all athletes young and old, but her main focus is now helping para-athletes play the sport of pickleball. And she and her growing team have big plans for the year. 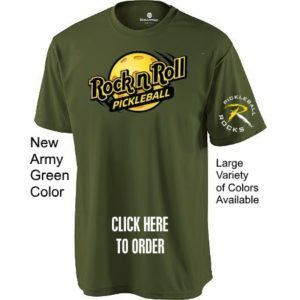 Rock N Roll Pickleball will be featured at this year’s National Veterans Valor Games. Adrienne and her volunteer team will be doing pickleball clinics and exhibitions on Saturday June 4 at the Valor Games Far West in Alameda, California. 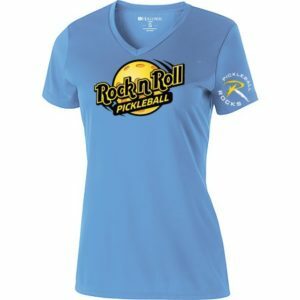 We have created a Rock N Roll Special Edition dri-fit shirt that will help raise funds for Adrienne’s travels as well as buying specialized wheelchairs and pickleball paddles to give away at events. Order your shirt by clicking on the shirt. So everyone get ready to Rock N Roll. 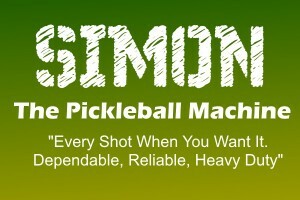 Based on your feedback and suggestions, we are continuing to improve and make SIMON the best heavy duty pickleball machine in the world. – SIMON now comes standard with wheels. Only machine in the world to have this easy to roll function. Try moving a Tutor to a different spot on the court when it has balls in it. – SIMON is now the only machine to have a wireless “on/off” remote with FOB. Works up to 100’ indoors or outdoors. Great option for teachers and coaches for only $79. -The 2 slot ball carousel has been replaced with a 4 ball slot “turbo” carousel. Now standard on all machines. Ball feed rates now as low as 1.5 balls per second for fast action when wanted. -Anti jam steel triangles added inside hopper on 2 sides to eliminate any open spaces where a ball can get stuck or jammed, plus a redesigned smaller ball guide, thus eliminating any jamming problems. -internal motors have been locked into place so they cannot shift during shipping which can throw off the delivery of the balls. This also makes the machine quieter and smoother. -Addition of a new 2nd “ramp” that clips on the front ball opening. This now comes standard on all machines.. The original 1st ramp gives true lobs for overheads. Tutor cannot seem to throw up lobs, just high volleys (reviews online are complaining about this). The new 2nd ramp creates higher ball loft and net clearance which allows for consistent and accurate dinks anywhere you want in the kitchen. Online, Tutor users have said it cannot do this consistently, balls barely clear net and many fall into the net. NO NEED TO SIT SIMON ON A TABLE TO GET THE SHOTS YOU WANT. SIMON DOES IT ALL. Remember, SIMON is made of heavy duty metal, with heavy duty wheels and motor for durable, long term use by clubs and heavy duty users alike. I believe they will continue to love SIMON.